Greetings from Peru! We have just arrived in Cusco and are settling in. Lima was lovely — a jumping off spot for us to visit Caral — oldest “Mother City” in the Americas, older pyramids than in Egypt. Only Mesopotamia is older than Caral. We had an amazing tour of that soulful place — a model of peace — where they lived in peace for 1000 years after building the city 5000 years ago. Our tour guide Dino was a magical person who has committed his life to the archeological renovation and education of people about Caral for the last 13 years. Rather than waiting for the usual 10-20 tourists to gather for a tour, Dino decided to take just the 5 of us: Janet, Mike, Jeffie and me, plus Guillermo our driver (a very lovely person, too). He recognized Jefferson immediately, taking special note of Jefferson’s jewelry: a bracelet J had gotten earlier this year from the Peruvian shaman Don Umberto, who came to Heartwood this year and last; Jefferson’s necklace made from fish bones and seeds, from a Brazilian friend, and J’s carved pendent of stone ducks, a symbol of commitment of a couple for life. 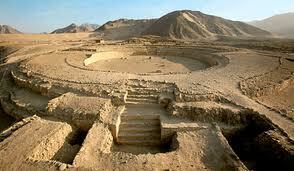 Dino observed that the people of Caral used stone, bone, and seeds for all their adornments [being pre-metal]. Dino looks like a shaman himself – with direct unsmiling gaze, and clearly allowing his intuition to speak to him. We made a very direct, deep connection with him — a very loving presence. He showed us special features, and brought the place and it’s careful, creative construction fully alive for us. This construction is anti seismic: built with heavy stones at the bottom, smaller stones set diagonally, and large margins of mortar – all allowing lots of “give” when tremors come. And so it has lasted 5000 years. Over the 1000 years of 3 primary phases of construction, never was anything torn down; rather new construction was build on top, increasing height and complexity of the construction. Fireplaces are found on every level, leading the primary archeologist, Dr. Ruth Shady, who discovered the pyramids of Caral in 1996, to theorize that the major spiritual rituals used fire to honor the gods. Dino and his comrades look forward with eagerness to finding the burial grounds for Caral – to enable them to answer many questions about the food, the health, the vestments, the burial practices, and much more on the people of Caral. Before completing the tour, Dino sang us three songs he had written about Caral. He sang in a beautiful, passionate voice, straight from the heart. He had tears – of commitment and joy. Then Dino gave us his blessing: he encouraged us to all stick together, and continue down our life path however narrow, steep, deep, or wide. As you go, he said, some stones will roll in as obstacles on your path. Receive each one as a gift and a message; learn what you can from that obstacle. Then write what you have learned on the stone, to share your wisdom with those who come after you. He gave us all hugs at our leave taking. Simply a magical experience.